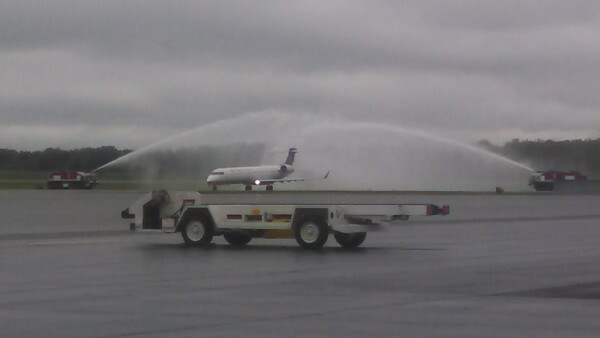 The first United Airlines flight from Chicago O'Hare International Airport landed in Bangor at Bangor International Airport on Thursday afternoon, June 5, 2014. It was greeted by a pair of firetrucks shooting arcs of water over the plane as it taxied in and a celebration thrown by the airport. 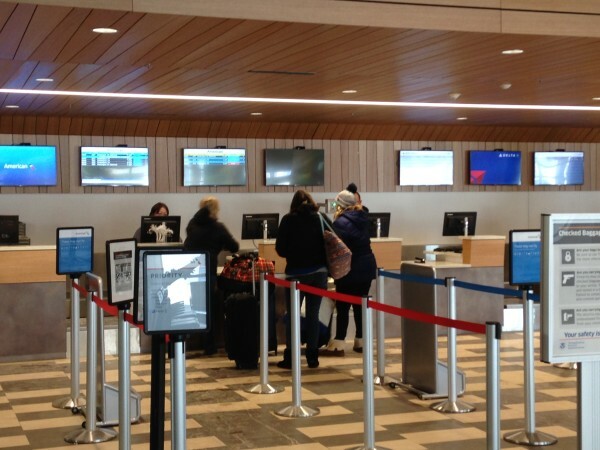 American Airlines ticket agents assist customers at Bangor International Airport recently. BANGOR, Maine — United Airlines is expanding at Bangor International Airport by adding seasonal direct flights between Bangor and Newark Liberty International Airport in New Jersey. The flights, on a 50-seat regional jet, will start July 1 and run daily through Oct. 29, airport officials announced Tuesday. Flights will operate once daily from Newark at 10 a.m., arriving in Bangor at 11:30 a.m., and departing Bangor at 1 p.m., arriving in Newark at 2:30 p.m. The round-trip ticket fare was listed around $1,700 Tuesday evening, according to United’s online ticketing service. A United spokesman said that was a premium price put in as a placeholder, and that the real ticket costs would be “significantly lower.” He expected the rates to be updated with more accurate fares sometime Wednesday. United returned to Bangor in 2014 after being absent from the city for two decades, offering seasonal flights to and from Chicago’s O’Hare International Airport. 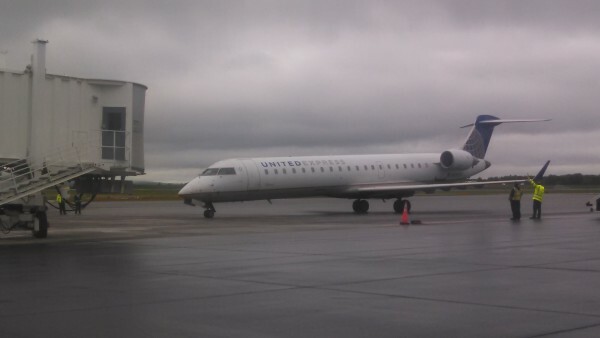 United pulled out of Bangor’s airport in 1993, about a decade after introducing Chicago flights to Bangor. At the time, the airline cited low passenger turnouts for year-round flights, especially in the winter, but the planes it used then had about double the seating capacity as the regional jets United uses today. In addition to Newark, United’s Chicago flights also will remain seasonal. “With the expansion by American in January to add a seasonal flight to LaGuardia there will now be 10,000 additional seats added to the Bangor market,” Councilor Joe Baldacci, chairman of the city’s Airport Committee, said Tuesday. American Airlines announced earlier this year it would offer weekend flights to and from LaGuardia during the summer months, June 4 through Sept. 4. Airport Director Anthony Caruso said airport officials hold frequent meetings with airline representatives to go over traffic numbers and pitch routes that could be successful. Newark is an important addition because of the many national and international connections it opens up. “It’s typically an open dialogue that takes many meetings and averages four or five years before you get any added services,” Caruso said. Bangor International officials have been working for years to add some in-demand routes. Newark was one of them. Others include Charlotte, Atlanta and Boston, which hasn’t had direct flights to Bangor since 2007, when American Eagle discontinued its service at BGR.